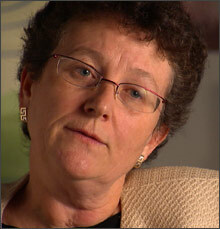 Clarissa Brocklehurst is UNICEF’s chief of water, sanitation, and hygiene. She talks with FRONTLINE/World’s Amy Costello about the problems UNICEF quickly identified with PlayPumps’ ambitious rollout in southern Africa and the broader challenges of providing water solutions there. “It’s a big, complicated sector…The needs are enormous.” This is an edited transcript of an interview that took place in New York, on October 28, 2009. "Rural Africa is a difficult place to work in for a number of reasons. And so even though we might get excited about a solution when it presents itself, we’ll always find that the solution comes with some sort of caveats, and it’ll be applicable in some situations and it won’t be in others." Amy Costello: When did you first hear about the PlayPump? Clarissa Brocklehurst: I think the first time was when I joined UNICEF. And what was your response to this device that was getting so much attention? What was of more interest to look at was that PlayPumps [International] was trying to look at a new model forO and M [operations and maintenance], We’ve been very interested in looking at this new model. So if anything is going to catch my attention, it’s something that’s going to come with a new paradigm for O and M.
How would you describe that new paradigm? What PlayPumps was proposing was to set up a closed loop, where the pump itself would be a source of income in order to support O and M. And we’re all open for innovation in that sector, so it was an interesting idea to explore. As an implementing partner with as much water and sanitation experience as you have, what do you think about how that rollout went? What were the lessons learned, the challenges, and the things that went well? UNICEF is always looking for innovation. We use a wide variety of pumps and look for new models of O and M. And so we experiment with different technologies a lot. And certainly PlayPumps were no exception. We have country offices that were interested and so we tried it out, especially because we do a lot of water and sanitation at schools. What we quickly found out was that the model didn’t work as well as we had hoped, and the country offices that tried it out came to the conclusion that it wasn’t a good option, given the type of programming that UNICEF wanted to do. There were various problems. First, the pump was very expensive. That was one problem, and we’re trying to serve as many people as possible for the same amount of money. So there were real concerns about the cost of the pumps. And it was very clear to us that, whereas it may be an appropriate pump for a school, it is not appropriate as a community pump. It’s difficult for adults to operate, and so that meant it had severe limitations for us because we were looking for models to serve communities. Why do you think it is difficult for communities to use? The pump’s based on children playing on it. And if you’ve got several children playing on it, they can make it go around. But if you’ve got a single adult who wants to pump the water, it’s very difficult for them to make it go round. And this is true of any merry-go-round technology. It’s going to be difficult and undignified for an adult to operate alone. How reliable a source of energy are children, especially when it comes to something as vital as water? I think the idea of using children as a source for drinking water may work in some instances. The problem is the difference between trying to serve a school versus a community. If you’re trying to serve a community, it’s going to be very difficult to find enough pumping time to be able to store enough water to serve the community. And in some cases, this is what we’ve found. So the question is, do the children have enough time to pump enough water? And we found that the sums just didn’t work out. As you know, the Clinton Global Initiative in 2006 announced that [AOL co-founder] Steve Case and his wife, Jean, and the United States government were donating $16.4 million over several years to support the PlayPump technology. I’ve talked to people at PlayPumps International who’ve been directly involved in the rollout and have said this was a technology driven by the celebrity factor, in part by donor enthusiasm, and that PlayPumps International has gone wild about it because it looks so good. Can you put this into context? Looking back over the last three years, what did the donor enthusiasm mean for the technology? so even though we might get excited about a solution when it presents itself, we’ll always find that the solution comes with some sort of caveats, and it’ll be applicable in some situations and it won’t be in others. The Case Foundation and PlayPumps International recently announced that they’re going to be giving their inventory of PlayPumps to another organization as a donation. Yet they are still putting in resources to help that organization institute water solutions. They are still involved in the struggle to bring more water to Africa. And that’s the thing that strikes me -- no matter what we have in the end here, three years later, the initiative started with very good intentions. Yes, and I think we see a number of initiatives started with good intentions. I think what we need to do is to harness all those good intentions. We have to have more recognition that water and sanitation are the underlying problem and that if we don’t fix that, we’re never going to be able to change the lot of women; we’re not going to be able to see universal primary education for African schools and children. So it’s a matter of looking for a broad range of solutions, not just one particular solution. I think that every pump has its place and an inventory of PlayPumps will find a place. One of the interesting things is dealing with the PlayPump as a piece of technology as opposed to an entire system. And I think within the pantheon of technologies we have, there’s a place for that technology. So certainly I see Case Foundation support of the sector as very welcome, and they’re generous, and I’m very pleased that they see water and sanitation as something that they’re going to support. What lessons can we learn from the last three years of the PlayPump initiative in Africa? I don’t know if I can speak specifically about PlayPump, but I can speak generally. You need a multitude of solutions involving a multitude of agencies. We need to look at the most local solution possible and bring the power of people. Our solutions have to be based in local capacities -- what the capacity of the local private sector is, what people can afford. We have to use our heads and our imaginations. And sometimes look for solutions in surprising places. And we need to do the same thing for water supply -- what local solutions we can build on. And make sure that the amount of time and money that people have to spend on water actually goes as far as possible. And we’ve got to think less about what is the magic bullet and what is the best technology, and more about how to come up with a tailor-made solution that suits the capacity of the people we’re trying to help. Why is local technology and thinking local so important when it comes to water? It’s important because of sustainability. Because a pump or a tank or whatever you put in is only as good as its first breakdown. So we have to think far more about the sustainability than we do about the technology itself. You can put in a beautiful, perfect pump, but if it breaks down and there are no spare parts, then it was only as good as the six weeks or six months that it lasted in the first place. So yes, we have to be aware of the technology because we have to come up with technologies that have good prospects for sustainability. But, in the end, sustainability is more about systems than it is about the actual kit. Between 2007 and 2008, Kristina Gubic was the communications manager for PlayPumps International South Africa. Carl Mitchell is a water coordinator for USAID. The high hopes, humbling admissions, and overselling by the media and its backers. 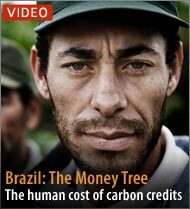 Watch FRONTLINE/World's latest report from Brazil's Atlantic coast where a carbon investment project developed by U.S. multinationals and green interests is causing controversy.